Açorda Alentejana is one of the most recognizable soups in Portuguese cuisine, originating in Alentejo. 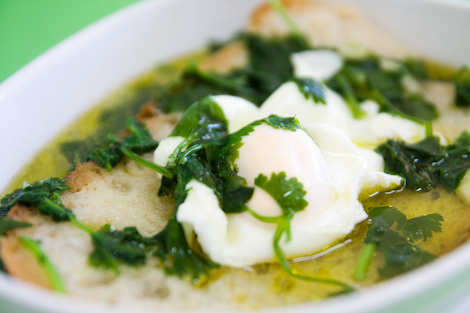 It is a very unique soup which combines bread soaked in delicious broth with cilantro and a poached egg on top. It is one of my favorite soups because it is both immensely flavorful as well as healthy and hearty at the same time. It is the great soup soup for just about any occasion and is always sure to impress. 2) Bring it to a boil, reduce the heat to medium-low and simmer uncovered for 20 minutes. Strain the broth and return it to the pot. 3) For the soup, place the chopped garlic, salt and pepper to taste, lemon rinds, and cilantro in a food processor until just smooth. With the machine running, drizzle in 3 tablespoons of olive oil. Scrape the mixture into a bowl and set aside. 4) Bring the strained broth to a simmer and poach the eggs in the broth for 2 minutes. Remove with a slotted spoon and set aside. 5) To serve, place the blended mixture into the bottom of a serving bowl. 6) Lay a slice of toasted bread on top of the purée. 7) Top the bread with a poached egg, and ladle the hot broth over the eggs. 8) Garnish with chopped cilantro and serve immediately. Is this the soup that they also call “sopa do espirito santo” ? Hi Grasiela, ‘Acorda Alentejana’ is very different from the Azorean ‘Sopas do Espírito Santo’. ‘Acorda’ is more of a light egg soup, while ‘Sopas’ are more of a substantial beef soup. Both use bread. An interesting side note: the ‘Holy Ghost Feast Sopas’ are so popular and the celebration so old in the Portuguese-American Communities that the Portuguese word ‘sopas’ was directly adopted into English. In Central California, ‘sopas’ is so generalized amongst English speakers that the word is frequently used to refer to any popular gathering where people celebrate with ethnic food. Great info, Pbicudo1. I did not know that. My mother uses mint leaves, Lucilia Rocha. I stumbled on this site because I was craving this soup. Very glad I did but I’m just going to call my mom and ask her exactly how she makes it.